Published by the Swiss NGO Disaster Risk Reduction Platform, this publication highlights case studies and best practices to promote community resilience to disasters and climate change. One of the most common measures used to deal with disasters and climate risks is soil conservation management, which has multiple benefits including preserving soil fertility and stabilizing slopes. Read full publication. The National Oceanic and Atmospheric Administration (NOAA) has developed a risk mapping tool that is now expanded to cover coastal areas along the entire U.S East Coast and the Gulf of Mexico. The mapping tool visualizes anticipated flood impacts, aiding preparation for coastal storms. Users select their location and the flood scenario of their choosing. Flood maps are then overlaid with any of the three exposure maps to show how floodwaters might impact area assets. The ecosystem exposure map provides data and information about natural areas and open spaces -including their proximity to development- to help communities identify which areas can be conserved for future flood protection benefits. Pollution sources are also identified to show where natural resources could be affected during a flood. Read more. The European Commission is seeking for innovative ideas to cope with climate change impacts, including implementation of ecosystem-based approaches. Proposals that demonstrate the potential for high replicability, rapid large-scale deployment and market uptake will be granted up to 8 million euros to implement their projects. Read more. Coasts in Java, Indonesia, suffer from erosion resulting in increased risk of flooding. 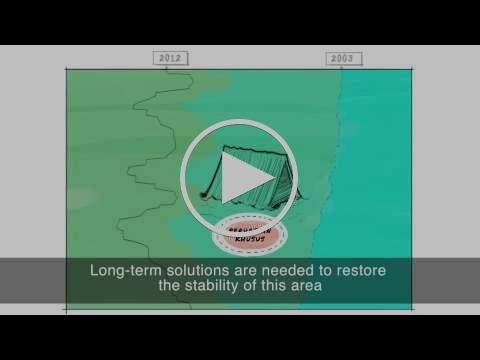 This video by Wetlands International presents how mangroves could provide a natural buffer against coastal storms and protect against shoreline erosion. Organized by the NASA-Applied Remote Sensing Training (ARSET), this on-line training aims to introduce NASA's remote sensing observations for monitoring extreme precipitation and flooding and to present flood mapping tools based on the remote sensing observations for flood management and planning. More information.